Yesterday got me thinking about how much this country is really doing to protect the health of its kids. Or should I say, how much it’s not doing? Is this handy new graphic an improvement on its predecessor? Sure. 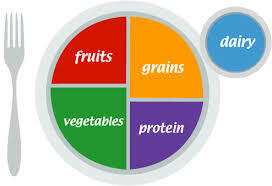 But considering the fact that the woefully misguided original pyramid called for six to eleven servings of bread, cereal, rice, or pasta, I don’t know if calling MyPlate an improvement is really saying much… do you? The First Lady (commonly called “FLOTUS” these days) recently came up with a “new” idea for getting kids to start eating healthier. And it starts with… drum roll please… home economics. She believes that teaching kids to cook may actually be the answer to the childhood obesity epidemic. In a recent meeting with reporters at the White House, Mrs. Obama stated the obvious—calling out the lack of basic culinary skills as a driving force behind the struggle to serve healthy food at home. Get kids in the kitchen, she says, and you’re giving them the tools they need to succeed nutritionally. And I have to say, it’s a wonderful idea (one I’ve been enthusiastically recommending for years). But I think there are some very fundamental flaws that will prevent the First Lady’s cooking campaign from making a real impact. Now don’t get me wrong. I think everyone needs to know how to cook. Because 1) it’s the only way you actually know for sure what you’re eating, 2) it’s easy, and 3) it’s fun. And don’t forget, it’s delicious, too. I love this time of year, not just because of the warm weather, but because of the abundance of delicious produce. Just this week, I made turkey meatloaf (with ground turkey from a farm less than 50 miles away) with freshly picked peppers; tuna steak (caught off Montauk and brought in fresh) with grilled broccoli and fresh spring onions, and for lunch today I’m having a delicious zucchini omelet that I made last night and brought with me to the office. All home-cooked, healthy, and a pleasure to eat. So obviously, I’m all for a little culinary adventure. But most public schools have had to cut physical education completely in order to accommodate tightened budgets. So how does FLOTUS expect them to throw cooking classes into the curriculum? I think it’s time to get real here. I know the Food Network is vastly popular. But it’s not because we live in a country full of aspiring chefs. It’s because we have turned the art of cooking into a spectator sport. In other words, people sure do like to watch it – even if they have no intention of ever actually doing it themselves. And that’s not even the main obstacle standing in the American public’s way. Look, I applaud Mrs. Obama’s intentions and her efforts to get the nation to eat healthier. But it’s hard for me to muster up much enthusiasm for this latest initiative. Not because you shouldn’t teach your kids to love cooking. I’m a huge advocate of getting kids involved in meal planning and preparation. And teaching them from an early age how delicious healthy food can be. But unfortunately, it doesn’t take a genius to figure out that the government won’t get very far with it. Because this lofty idea of teaching kids to cook ignores the real root of America’s obesity problem. People aren’t buying processed, nutritionally bankrupt pre-packaged food simply because they don’t know how to cook. They’re buying it because it’s cheap. And this is especially true for families who are struggling financially—which happen to be one of the First Lady’s primary demographic targets. And why is this “non-food” so cheap? Because the government subsidizes killer cash crops like soy, corn, and wheat—essentially paying already-rich companies to produce more of them. That’s why. Call me a cynic, but I can’t help but think this cooking campaign is all a big smokescreen. One designed to hide the fact that, since FLOTUS embarked on this healthier nation program of hers, we haven’t actually gotten one bit healthier. Adamy, Janet. “Old School: Michelle Obama Says Students Need Cooking Skills.” Wall Street Journal. 18 June 2014.